You think of players reaching their mid 30s and think they’re over the hill and slowing down. Well over in Japan there is a player well past that mark and he can score goals, his name is Kazuyoshi Miura. The Japanese forward who plays at Yokohama FC in the J League 2. 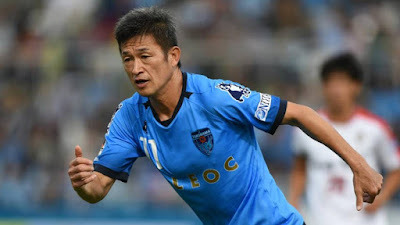 When he scored once again for his club against Thespakusatsu Gunma on the 12th March it fired him in to the record books with a winning goal in a 1-0 win. It was not any goal as this one meant he became the oldest player to score a goal. The record was previously held by an Englishman with the name Stanley Mathews who set the record in a game back in 1965. Miura isn’t just the oldest player to score a goal in Japan he is also one of their greatest players. Back when the J League started in 1993 he was one of the best players in the league. In 1993 he was also announced as Asian Player of the Year although this was not an official award. He also didn't just entertain crowds in Japan as Miura also was the first Japanese player to play in Italy with Genoa, he was also at Brazilian Club Santos and Croatian side Dinamo Zagreb to list a few of his 14 clubs. Miura record for Japan is not bad also, before his retirement from the international stage he managed 55 goals in 89 appearances. He also scored 14 goals on his way to helping Japan reach the 1998 World Cup their first ever World Cup. Unfortunately for Miura despite scoring a hat trick in a friendly for Japan in the build up to the World Cup he was not called up for France 98, meaning despite all his impressive stats he was unable to ever play at a World Cup. Ironically his age played a part in not calling him up in 98 despite the fact he is still playing two decades later. Having signed a year contact at the beginning of the J League season it is not clear if he will sign a new one but here is his record breaking goal in case we don’t get a chance to see much more of Miura.